With City reporting a profit of £250,000 for last season The 1973 to 74 season started with the announcement that Chairman Eric Alexander would be stepping down due to lack of time and that Peter Swales would be taking over in October. It was to be manager Johnny Hart’s first full season in charge and City’s pre-season started with friendlies at Aberdeen which The Blues won 1-0 followed by another 1-0 win at St Johnstone . Then back in England and a 2-2 draw at Oldham and a 0-0 draw at Blackpool. Next came the Charity Shield which was played at Maine Road. City losing 1-0 to a talented Burnley side. The opening game of the season saw Denis Law make his Maine Road debut for the second time around and he scored twice as City beat Birmingham 3-1. This was followed by a 1-0 defeat at Derby then a 1-1 draw at Stoke. A Rodney Marsh penalty beat Coventry 1-0 at Maine Road and City continued their 100% home record with a 2-1 win against Norwich . 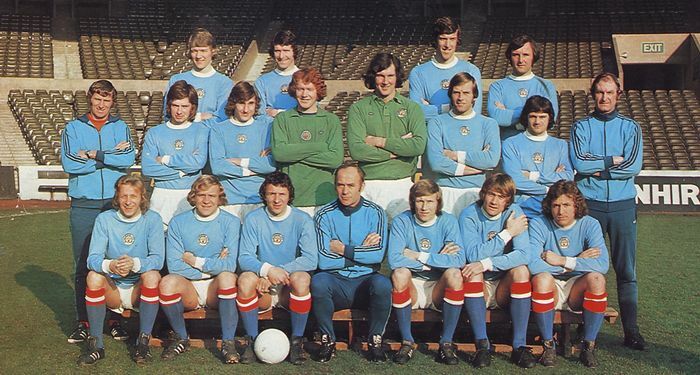 Another Rodney Marsh goal couldn’t stop a trip to Coventry ending in a 2-1 defeat, staying in the midlands the Blues managed to salvage a point in a 1-1 draw at Leicester leaving the Citizens in 7th place in the league with 7 games played. Back to Maine Road and a back in favour Francis Lee scored two as City beat Chelsea 3-2, however a 3-0 defeat at Burnley saw The Blues slip to ninth in the league. City then visited Walsall in the League Cup 2nd Round and earned a replay in a 0-0 draw. Joe Corrigan had been under some criticism and for the last three games, Ron Healey had been deputising between the sticks, however John Hart felt the need to buy another top class keeper and so splashed out £100,000 on Motherwell’s Keith MacRae who made his debut in the next game against Southampton , who would be the first team to take a point a Maine Road as City drew 1-1 with The Saints, this was followed by another away defeat losing 1-0 to Newcastle . However The Blues finally got their first away win of the season with a 2-1 win at Sheffield United . Walsall proved to be a hard team to beat as City drew 0-0 again in the replay of the League Cup second round tie. City then visited Old Trafford for Tony Dunne’s Testimonial and beat Manchester United 2-1. The Blues failed to score in their next game as well resulting in their first home league defeat of the season losing 1-0 to Leeds, which was followed by some bad news as Johnny Hart had to step down as Manager due to health reasons, and Tony Book stepped up to the plate and was made Caretaker Manager pending the hope that Johnny would be able to return. Ken Barnes who was assisting Hart at the time wrote in his biography “It was never going to be easy for Johnny. He was a good lad, who’d been a good player. He was a bit laid back and also had problems with his health and there were elements of the job that he just couldn’t cope with. He found it hard to drop players or even leave them out. Looking back, maybe Johnny took on the job out of a sense of duty to the club; without thinking it through…” it just proved too much for him. City were spurred on by Book’s appointment though and 3 days later, eventually they finally saw off Walsall in a League Cup 2nd Replay at Old Trafford winning emphatically 4-0 including a Francis Lee Hat-trick. Another blank in the league drawing 0-0 at Wolves was followed by a 1-0 victory at Carlisle in the 3rd Round of the League Cup. Prior to next game at home to The Gunners. 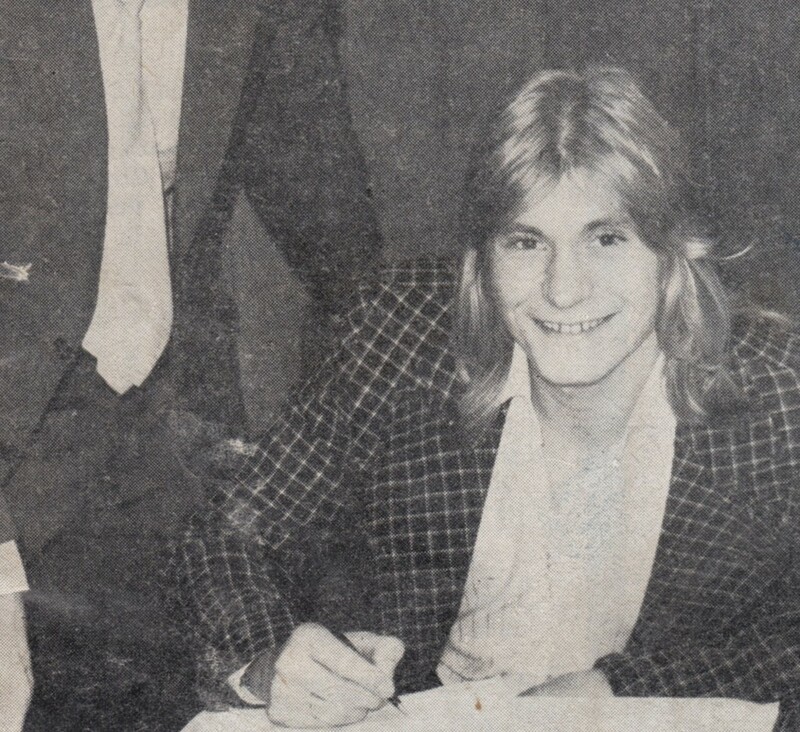 Tony Book made his first signing taking Mike Lester from Oldham for £45,000. Lester’s debut was not a lucky charm as City lost to Arsenal 2-1, however a Rodney marsh penalty salavaged all two points for The Blues in their next home game beating QPR 1-0. Back to the Cup and City failed to score again against lower league opposition earning a replay in a 4th round 0-0 draw against York . Unfortunately City’s bad away form in the league followed as they lost 2-1 at Ipswich. 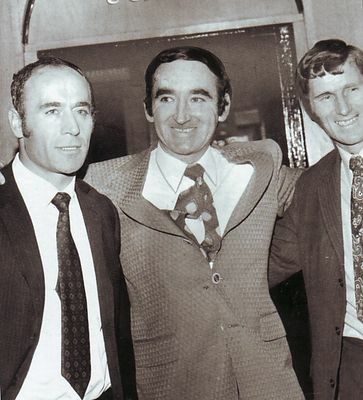 With the sad news that Johnny Hart would not be returning as Manager Peter Swales made the decision at this time to bring in Ron Saunders from Norwich as a permanent manager to replace caretaker boss Tony Book. The country was in a recession and with power workers on strike City avoided having to play the replay at Maine Road in front of a small crowd at 1pm midweek by hiring a generator for £1,000 and the tie went ahead in the evening as planned, nearly 18,000 fans saw Rodney Marsh score a hat-trick as City went through to the 5th round beating York 4-1. Back to the league and the ‘Saunders factor couldn’t help in a 2-1 defeat at West Ham , however a second game in London saw the Blues beat Tottenham 2-0 leaving City in the bottom half of the table in 15th position. As in the previous rounds of the League Cup there was still no luck of the draw for City in round five as they were Paired against Joe Mercer’s Coventry at Highfield Road, City earned another replay with a 2-2 draw. This was followed by their second 2-0 league win on the trot beating Burnley 2-0 at Maine Road, but the Blues away form failed them again losing 2-0 at Everton on Boxing day and drawing 1-1 at Norwich in their last game of 1973. A new years day crowd at Maine Road didn’t have much to cheer about as City drew 0-0 with Stoke , but four days later the Blues travelled to Oxford in the FA Cup 3rd Round and trounced the lower league outfit 5-2. Another good 2-0 home win this time against Leicester saw City move up to 13th in the table, however they were fairing a lot better in the League Cup as they progressed to the Semi-Finals beating Coventry at Maine Road 4-2 in a 5th Round Replay. Back to the League and the Blues moed up to 12th with 1-1 draw at Birmingham . The Cup games were coming thick and fast now and City travelled to Plymouth for the semi-final 1st leg where they earned a 1-1 draw to take back to Maine Road for the second leg. A change of competition to the FA Cup saw City play their first ever Sunday game, but were well and truly beaten at Nottingham Forest 4-1. Straight back to the League Cup and City coasted through the 2nd leg against Plymouth with a 2-0 win at Maine Road sealing a trip to Wembley in March for the Final. City continued their mediocre mid-table League form with a 0-0 home draw against Tottenham , then beat Derby 1-0 at Maine Road, followed by a 1-0 away defeat at Chelsea and a very good performance at Southampton winning 2-0 the week before the Blues travelled to Wembley to play Wolves in The League Cup Final, and although City were favourites they lost on the day 2-1. Back to the League and a 1-0 defeat at Leeds left City mid-table in 11th place. 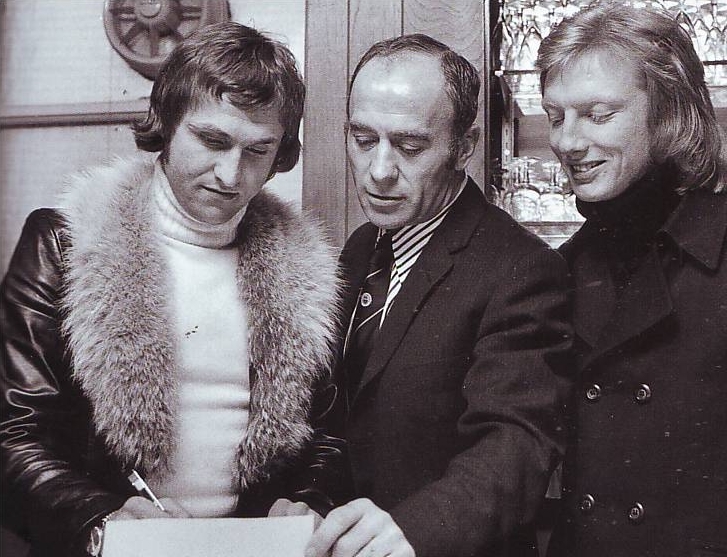 It was time for Ron Saunders to enter the Transfer market for the first time and he made a double swoop by bringing Dennis Tueart and Mick Horswill from Sunderland with Tony Towers going to the Wearsiders as part of the deal. With Manchester United fighting relegation the first Derby of the season was never going to be an attractive affair and Mike Doyle was sent off in an ill-tempered 0-0 draw at Maine Road, Tuearts addition didn’t help as City failed to score in the 3rd consecutive game as they lost 1-0 at home to Sheffield United and 2-0 away at Arsenal as they dropped to 16th in the League. The Blues then went on a run of 3 home games unbeaten beating Newcastle 2-0 and drawing 1-1 against Wolves and Everton . Ipswich brought City down to earth however with a 3-1 win at Maine Road. And then QPR beat The Blues 3-0 at Loftus Road. City’s form was enough for Peter Swales to end Ron Saunders short tenure as City boss he had failed to win over the fans and he certainly was not a favourite with many of the players both with his tactics and demeanour. There are many stories of senior players unhappy that Tony Book had not been made boss instead of Saunders.Mike Doyle remenbers he was told by Saunders “Listen I don’t want my back four to play football. If you get the ball just lump it forward and we’ll go from there”. Not something that players who had been coached by the likes of Malcolm Allison wanted to hear. Player power won the day and Swales realised that Tony Book was the man for the job and he took over the reigns. City then played a double header against Liverpool drawing 1-1 at home but losing 4-0 at Liverpool’s Anfield. City’s last home game was a 2-1 win against West Ham and then an emotional goal from Denis Law saw Manchester United’s relegation confirmed as City won 1-0 despite an Old Trafford pitch invasion from the home fans. And so in the season City celebrated 50 years at Maine Road the team finished 14th and were runners up in the League Cup. 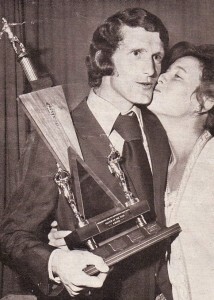 Mike Doyle was voted City’s Player of the season. A still ill, Johnny Hart then received an end of season testimonial game as City faced Stoke at Maine Road.